With its breathtaking 180-degree views of Chicago’s skyline, The Robey&apos;s outside-of-the-Loop location makes it a one-of-a-kind hotel. The intersection where it sits has long been a creative gateway to the many area galleries, cafés, studios, independent boutiques and live music venues that populate one of the hottest neighborhoods in the city. And since The Robey is steps away from the Damen stop on the CTA&apos;s Blue Line, you&apos;re guaranteed to be ushered straight to the heart of downtown in mere minutes. The Robey goes the extra mile when it comes to in-room amenities. 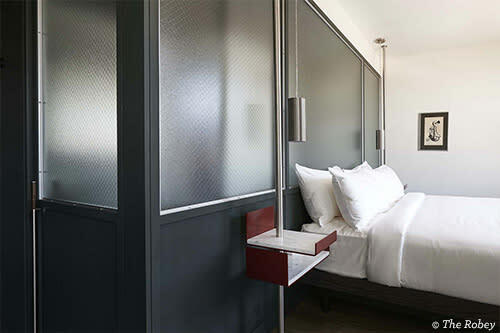 In each guest room you&apos;ll always find personal-care amenities from Le Labo, 400-thread count sheets, signature soft denim robes, complimentary Wi-Fi, Bluetooth-enabled sound systems with personal media streaming, waterworks bath fixtures, custom-made terrazzo tiles and bold accents of oxide red and Calcutta marble tabletops designed for work or dining. Landmark Queen: 235 sq. ft. room including a queen-sized bed and intimate seating area. Room has southern views of Wicker Park and Bucktown’s tree-lined streets or Chicago’s Elevated train. Urban King: 330 sq. ft. room featuring a king-sized bed and sofa for additional seating. Boasts southern views of the iconic city skyline. Corner Suite: 390 sq. ft. suite featuring a king-sized bed, double vanity, sitting area and work desk. 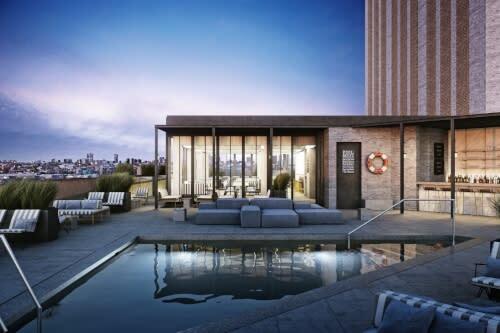 Offers sweeping views of the city. Panorama Suite: 675 sq. ft. top-floor suite including a king-sized bed, double vanity, comfortable sitting area, work desk and living room with a private bar. Boasts 180-degree views of the Chicago skyline. 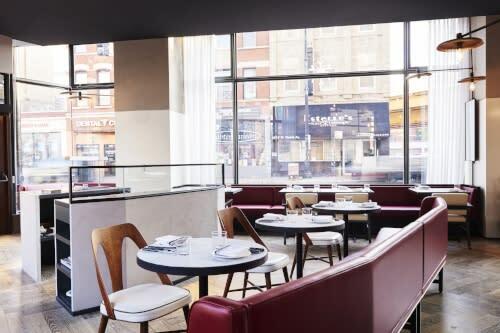 Housed on the street level of The Robey, Café Robey is one of the best Wicker Park picks for French-American inspired cuisine in a warm setting that manages to be both casual and elegant. Dig into breakfast, lunch, dinner and weekend brunch offerings as you enjoy the view along Chicago’s “Six Corners.” Just upstairs from Café Robey, a second-floor lounge offers complimentary Wi-Fi, a bar with specialty cocktail and wine offerings and an assortment of snacks and breakfast pastries for guests plugging in for the workday or meeting with friends over a drink. 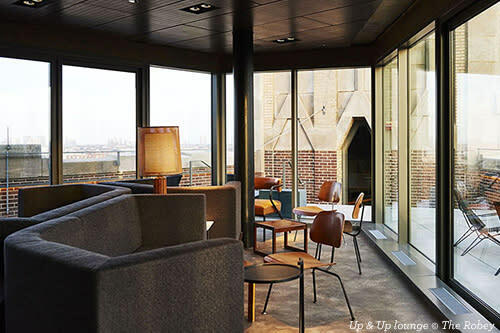 Up & Up is The Robey&apos;s 13th-floor lounge, where you can sip cocktails as you take in the stunning skyline views. This summer, the open air terrace promises to be the place to be in Wicker Park. Open now as well, the 6th floor Cabana Club, with its picture-perfect rooftop pool, welcomes guests with a selection of Greek-inspired dishes and a selection of handcrafted drinks. There&apos;s no need to find a separate hotel for your canine BFF: The Robey welcomes four-legged-friends. For more information, or to make a reservation, visit therobey.com.